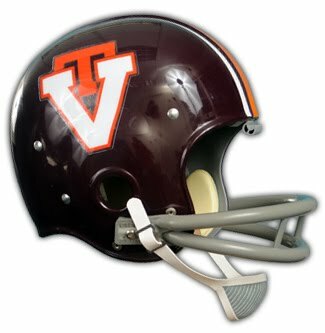 During the game with Marshall, the Hokies will wear maroon helmets with orange and white stripes and the old T within the V logo, in honor of Tech great Frank Loria. The helmet is a replica of the one worn by Loria during a brilliant Tech career. 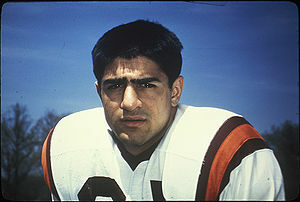 The Clarksburg, W.Va., native earned first-team All-America honors at safety in 1966 and went on to become Virginia Tech’s first consensus All-American as a senior in 1968. Loria was a member of the Marshall University coaching staff when he died in the tragic Marshall plane crash in 1970. Loria was selected a charter member when the Virginia Tech Sports Hall of Fame was established in 1982. In addition to the throwback helmets, this game is the White Out game which aims to promote reading across the Commonwealth. I don’t know about you, but I think the old-style VT is badass. I hope the team keeps this as a regular part of their uniform for at least one or two games a year. It would be cool if we wore this and the throwback jerseys to the bowl game every year. I say we start a movement to get the throwbacks as our bowl unis. Who’s with me? Anyways, in summary, nicely done, Virginia Tech. Keep making us proud. You are currently browsing the archives for the Frank Loria category.